Beginning in 1895, large numbers of Polish immigrants began to settle in Lorain, where they found employment on the docks and in the steel mills. They attended services at St. Mary’s Church but desired a pastor who could speak their own language. The pastor of St. Mary’s, Rev. Joseph Eyler, petitioned Bishop Ignatius Horstmann on their behalf for a priest conversant in Polish and the establishment of their own parish. However it was not until January 11, 1898, that the bishop was able to send Fr. Adolph Swierczynski to serve as the resident pastor for the Poles. Fr. Swierczynski also had charge over the Polish mission at Grafton, Assumption B.V.M., where he held services on the alternate Sundays that he was not in Lorain. The first Mass by the new pastor was said January 16, 1898. Upon his arrival, Fr. Swierczynski arranged for services to be held in St. Mary’s School and the new parish was placed under the patronage of St. John Kantius. Starting in April, 1898, the parishioners began to meet in a schoolroom of St. Joseph’s Church. Fr. Swierczynski resigned in June of that year and immediately was replaced by Fr. Charles Ruszkowski, who in October received permission to use the chapel in the basement of St. Joseph’s Hospital for services for the rapidly growing congregation. Both Fathers Swierczynski and Ruszkowski searched for a suitable place to build a church and in April, 1899, six lots were finally procured at the comer of Park Street and Eighth Avenue, later renamed to Lexington Avenue and Fifteenth Street. 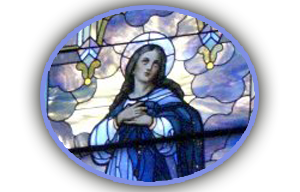 It was around this time that the bishop changed the name of the parish to Nativity of the Blessed Virgin Mary. Ground was broken on July 6, 1899, and the cornerstone was laid on August 27 by Bishop Horstmann. 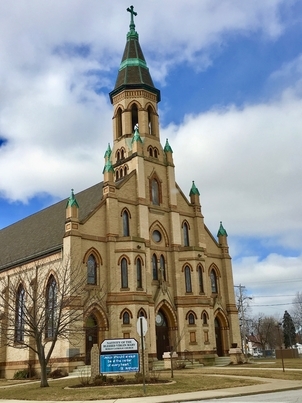 On Easter Day, 1900, the congregation processed from St. Joseph’s Hospital to the new wooden combination church and school for the first Mass in their own place of worship. The church was dedicated to the service of God on September 9 by the Vicar General, Monsignor F. M. Boff. By the beginning of the same month, the parish school, located in the lower story of the building, was started with 63 pupils in attendance and education provided by a lay teacher. Fr. Ruszkowski left in June, 1902, and Fr. Ignatius Piotrowski, was placed in charge. The latter was transferred in March, 1903, and the former returned. That same month, Assumption Mission in Grafton was granted its own resident pastor and the pastor of Nativity was relieved of the duty of assisting there. Membership in the parish continued to increase as more Poles immigrated to Lorain. By February, 1908, their numbers necessitated the formation of a daughter parish, St. Stanislaus, to serve those living in South Lorain. That same year saw the arrival of the Sisters of St. Joseph, Third Order of St. Francis, to begin their distinguished record of teaching and spiritual service to Nativity. With steady growth, the church, built to seat 500, was soon too small and plans were implemented to build a new house of worship. Fr. Ruszkowski was transferred in March, 1912, and the parish was put in the care of Fr. Thomas Wilk for several months until Fr. Andrew Radecki was named administrator in July. He and the parishioners resourcefully pressed forward with the proposition of erecting a new church. Fr. Radecki was named pastor in July, 1914. Diocesan requirements stated that half the necessary funds be in place before construction could begin and this was accomplished by August 16, 1914, when the ground for the new church was consecrated. William Ginther of Akron was the architect of the edifice and Anthony Wasielewski of Minneapolis was selected as the contractor. The foundation and basement were finished that fall and work resumed the following spring. On April 25, 1915, the occasion of the laying of the cornerstone by Monsignor T. C. 0’Reilly, Chancellor, a throng of 8,000 gathered for the solemn festivities. Construction continued throughout the summer and fall on the large gothic structure, faced in yellow brick and built to seat twice the number of the original church, much of the toil provided by parishioners, employed under a day labor system. The first Mass in the new church was said on November 14 and the dedication with Bishop John Farrelly as the main celebrant took place on Thanksgiving Day. The new house of worship, in the same manner as the old, was placed under the protection of Our Lady of Czestochowa. The old combination building was renovated to serve exclusively as a school but burgeoning attendance there soon too compelled the parish to consider a new school building. Two additional lots were purchased and excavation began in November, 1921. Bishop Joseph Schrembs presided at the dedication of the three story, matching yellow brick building on November 12, 1922. The building has twelve classrooms on the three upper stories and two large rooms and an auditorium in the basement. Fr. Radecki was assigned to another parish in July, 1924, and was succeeded by Fr. Dominic Mielcarek, who in turn was followed by Fr. Stanley Rogosz in September, 1929, and Fr. Ignatius Dembowski in July, 1930. Nativity saw over 500 men and women of the parish leave to serve in the Second World War. The parish’s Golden Jubilee Mass was celebrated by Bishop Edward Hoban on June 20, 1948. The same day, ground was broken for a new convent to replace the one that had been occupied since 1917. Other capital projects, including placing a brick veneer on the rectory and installing a new heating system in the church, took place at the same time. The convent was blessed by Bishop Floyd Begin in September, 1949. Fr. Dembowski retired in January, 1952, and pastoral duties were assumed by Fr. Edwin Osowski, who died in September, 1954, and was replaced by Fr. Stanislaus Rybacki the next month. During Fr. Rybacki’s pastorate, a local boy started a fire in the church’s sacristy, which was destroyed, and substantial smoke damage to the interior of the church was incurred. In 1965 the church and school were repainted and redecorated. Fr. Rybacki left the parish in February, 1966, and Fr. Stanislaus Ciolek arrived later the same month. In September, 1967, a new rectory and garage were built. Fr. Ciolek expired in March, 1970. and Fr. Casimir Cudnik was named pastor the following month. It was Fr. Cudnik who had the picture of Our Lady of Czestochowa restored and placed in the main altar. Fr. Cudnik also died as pastor in June, 1971. Fr. Casimir Pilatowski was appointed pastor the following month. The same year, the organ, the purchase of which was originally funded to a large extent by Andrew Carnegie in 1917, was rebuilt and expanded. The next year, a new heating system was installed in the church. Fr. Pilatowski retired in September, 1982, and Fr. Robert Bielek took charge in November of that year. Due to declining enrollment and increasing tuition costs, the parish was forced to close its school in 1987. In celebration of the parish’s ninetieth anniversary the following year, a major renovation program for all parish properties was undertaken. Projects included making the church handicapped accessible, masonry repairs to the church and school, repainting the church, church roof replacement, new wiring and sound system, and refurbishing the stained glass windows. Much of die remodeling was performed with the volunteered time and talents of parishioners. In 1996 the church was air-conditioned. Fr. Bielek was transferred in August, 1997, and Fr. Ronald Turek was named administrator. Fr. Robert Glepko was appointed pastor on December 12. With many special events and activities, the year 1997 was a period of preparation and celebration of the parish’s one hundred years of faith and service to the City of Lorain. The festivities culminated on January 11, 1998, with a Jubilee Mass, banquet, and the pastoral installation of Fr. Glepko. Recent improvements to the parish have included a program of complete restoration of all the stained glass windows in the church, the installation of the beautiful new church doors and a new boiler, and the erection behind the rectory of a shrine to Our Lady.